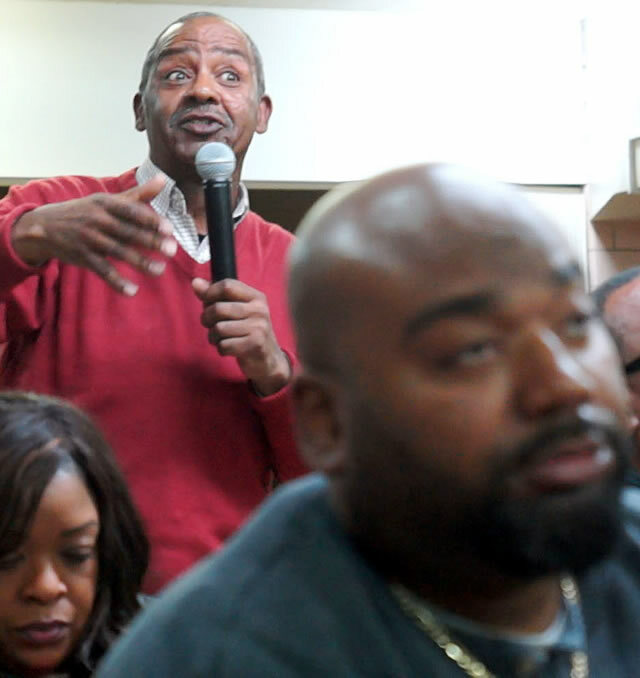 About 200, 8th Ward residents showed up for a scheduled community meeting at St. Ailbe church in the rainy-cold only to find out in the church’s parking lot that the meeting had been canceled. Certainly, the 200 attendees were baffled and taken aback when they got the cancellation news in the parking lot. They were angry and felt that someone had sabotaged their plan of getting together to discuss their opposition to a project the alderman has sanctioned and the majority of the community residents do not want. “This just put more gasoline on the fire,” said one of the residents, when hearing that the meeting had been canceled without notice. “This will only make us work harder to keep it out. We don’t want it in our neighborhood, the alderman wants it there. I say put it somewhere else.” That was the overall feeling of all people who attended the meeting in their interaction with each other in the parking lot. That’s why they came to the meeting in the first place – to find ways together to stop the building from coming to the area. Said another 8th Ward resident: “We want the alderman to know that we don’t want this huge, low-income building in our neighborhood. We will fight tooth and nail to keep it out. She better take heed or she will be voted out of office in the next election. 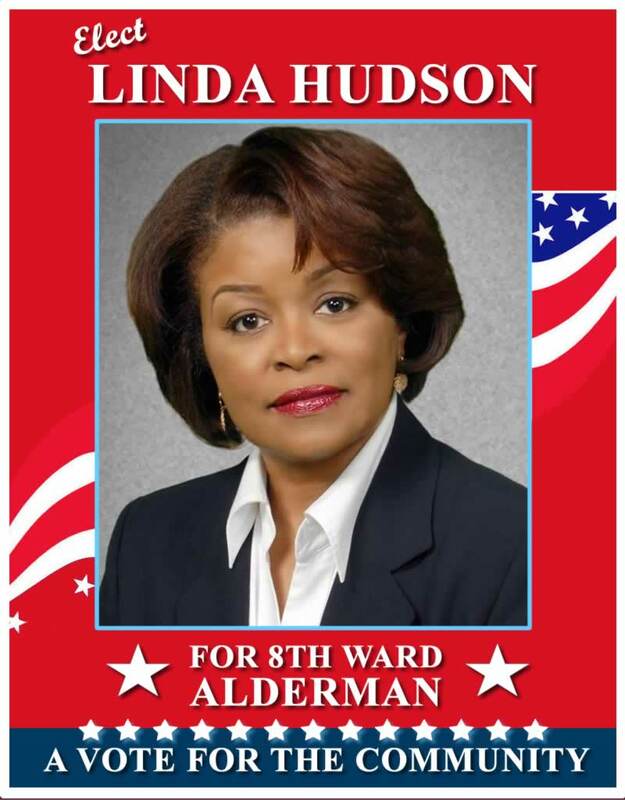 This is the same alderman that was going to bring a marijuana business and pawn shop into the 8th Ward. 8th Ward residents fought back and kept them both out. Many of the prospective attendees voiced disappointment and anger that St. Ailbe had canceled the meeting at the last minute. But according to a staff person at St. Ailbe Church, the meeting was canceled sometime ago after they learned that a woman had falsely called in and used the name of another person to use the meeting room, and there was no telephone number listed to call the person back. She had used the name of a woman several in the church was familiar with. The staff person said the woman whose name was used was part of the Calumet Heights group that meets at St Ailbe every month. The lady that called in and scheduled the meeting used her name, but the woman whose name was used said she didn’t call and schedule a meeting. While St. Ailbe has always been a good neighbor in the community and has provided availability to many organizations to utilize their facility for meetings over the years, they had to cancel the meeting because someone had called the church and falsely used the name of someone else. The alderman had a meeting on March 27 at the Montclare senior residence on East 78th Street. 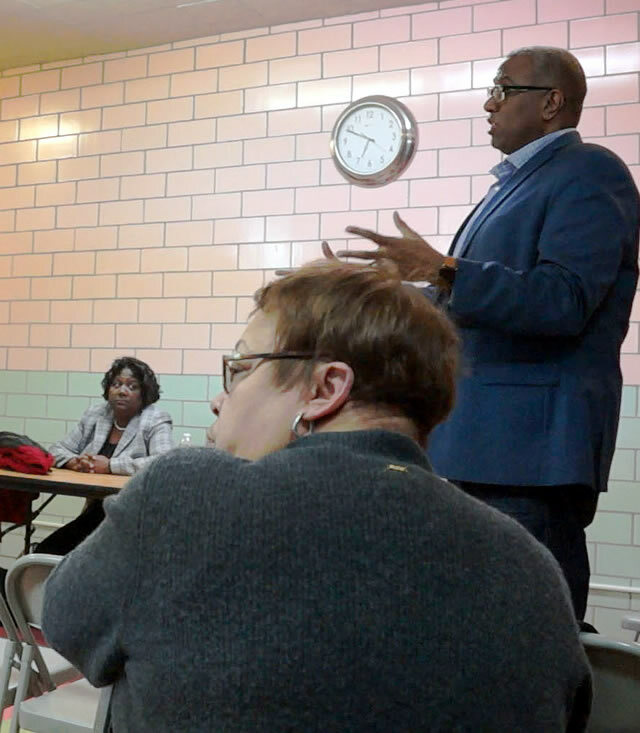 “The meeting should have been held in Calumet Heights where the people who will be affected live.” said Hudson.” Reportedly, the alderman told people at the meeting that “We need to jump on this opportunity because some white alderman would want it….We really don’t need more senior housing in the ward. The ones that are here already have vacancies. “We sent her (Alderman Michelle Harris) an invite for the meeting last night (the one that was canceled). We were disappointed when we got to meeting and it had been canceled. One of her staff persons was passing out flyers in the parking lot and told people that the meeting had been canceled. Fifty years ago, an assassin’s bullet cut down one of our nation’s most beloved civil rights leaders. Yet Dr. King’s legacy – and his values – abide today. We see his impact in every protest against police violence, every picket that demands funds for public schools over cop academies, every lawsuit opposing Chicago’s racist gang database. The white supremacy that Dr. King defied has not ended in the years since he was gunned down – yet the heartbreak of his murder did not defeat his peers or the generations of activists that have stepped up since April 4, 1968. The struggle for racial and economic justice is growing today in this nation, despite fierce opposition from the highest ranks of government. Dr. King denounced the “triplets of racism, extreme militarism and materialism.” Those distorted practices continue to afflict our city and our nation today, often in the guise of policies promoted by those who proclaim themselves ‘progressive’ while they foist terrible injustice on poor people and people of color. In Chicago, we’ve seen the ranks of Black teachers cut in half in just the last five years alone – with a lower percentage of Black teachers today in our city than when Dr. King came to Chicago in 1966. We’ve seen our schools shuttered and our students dispossessed by a callous, unelected autocracy that promotes segregationist policies and educational apartheid for the bulk of our students. We’ve seen unarmed Black and Brown people gunned down by state agents who face few – if any – consequences for their actions. We’ve seen our Black and Latinx neighborhoods robbed of their fair share of funding for housing, health care and living wage work. In the face of all of this inequity and opposition, the movement for racial and economic justice endures. A growing number of Chicagoans are mobilizing to demand an elected, representative school board, an end to racist school hiring practices, and sustainable community schools that offer poor Black and Brown children the supports they need and deserve not just to survive, but to thrive. Progressive projects – with youth of color in the lead – are demanding living wage work, an end to handouts of public lands and public dollars that privilege the wealthy few, and a city that protects all of its residents from the perils of poverty, eviction, criminalization, deportation and violence. Dr. King died in Memphis defending the rights of striking Black city workers. Chicago’s mayor has simply privatized many of these workers – including in our schools. Yet the struggle to advance labor rights continues, including the battle in Springfield to close the 4.5 loophole – Section 4.5 of the Illinois Educational Labor Relations Act. Ending that loophole will return to Chicago’s teachers the power to challenge intolerable conditions like overcrowded classrooms and third party contracts that leave our schools filthy while Aramark and Sodexo get filthy rich. In the last month, teachers’ strikes have broken out across the nation, as educators join with parents, public workers and grassroots residents to demand equity and take a stand for the dignity of their labor. We saw a wave of truly progressive Black and Latinx political candidates win races in last month’s primaries, ousting some of the region’s most intransigent political hacks. And Chicago is the locus of a growing movement against school privatization and the lie of school ‘choice’, grounded in a deeper drive for economic equity – the thrust of Dr. King’s work in the last years of his life. For Dr. King, racial justice was intrinsically coupled with economic justice – and today’s activists and allies do not merely acknowledge that intimate connectedness, but demand its embrace. Today’s critical struggles link directly to Dr. King’s memory, legacy and vision – and his values are as relevant today as they were fifty years ago. The Chicago Teachers Union is proud to stand today with Chicago’s Black and Brown communities in our ongoing struggle to bring into being Dr. King’s vision for a more just and equitable nation. Oak Park, IL (BlackNews.com) — The Legacy of the Tuskegee Airmen Continues: The Eyes Above The Horizon Event promises to inspire minorities interested in Aviation. At-risk youth from all over the country are encouraged to participate. On April 21, 2018 the LFA will host “The Eyes Above The Horizon”. Participants will fly in a single engine airplane, receive instruction in basic aviation principles, and explore the STEM Principles incorporating Science, Technology, Engineering, and Mathematics. Florida officials appealed U.S. District Judge Mark Walker’s order that the state change its process for restoring voting rights to people with felony convictions. Judge Walker ruled that the current process is unconstitutionally arbitrary because it gives state officials unfettered discretion to grant or deny voting rights for any reason. He gave the state until April 26th to create a new system. After Judge Walker struck down Florida’s process of rights restoration, the Quad-City Times editorial board argued that Iowa’s system is also unconstitutional. “Florida’s discredited system of enfranchisement is bad enough, requiring the direct approval from the governor or one of his cabinet for the restoration of a felon’s voting rights. Iowa’s is even worse…only the governor can restore voting rights.” There are more than 56,000 people disenfranchised in Iowa, and about 49,000 are not incarcerated. The editorial board called on the Legislature to take up the issue of restoring rights to people who have completed their sentence during the next session. In the meantime, they called for a creation of a committee to expedite the petitions that have been ignored by the Governor’s office. California allows individuals incarcerated in jail awaiting trial, serving a misdemeanor or probation violation, and those serving a county jail sentence for a low-level offense to vote. As part of the American Civil Liberties Union’s “Unlock the Vote” campaign, volunteers have been going inside Los Angeles and Orange County jails to register and educate eligible incarcerated voters. The campaign aims to have thousands of people in jail registered to vote for the June primary and November election. Mississippi bans people with felony convictions from voting for life if they have been convicted of one of 22 disenfranchising crimes. In order to regain voting rights, impacted individuals have three options: apply for a pardon from the governor; apply for an Executive Order Restoring Civil Rights from the governor; or have the State Legislature pass a bill of suffrage on their behalf (which must pass with two-thirds majority). This process results in very few people actually regaining their right to vote. According to The Sentencing Project, only 30 percent of Mississippians who have attempted rights restoration have had their rights restored. Paloma Wu of SPLC said they decided to bring the suit now after seeing the progress made with lawsuits in Alabama and Florida. “There have been, in both of those lawsuits, some quite extraordinary decisions that we feel here in Mississippi are leading the way for a state like ours,” said Wu. Crystal Mason, 43, was sentenced to five years in prison for illegally voting in the November 2016 election. In Texas, individuals with felony convictions are barred from voting until they have fully completed their criminal sentence. Mason was on supervised release when she voted in the election, and testified that she did not know she was prohibited from voting. During her testimony, Mason said that an election worker walked her through the process of filling out a provisional ballot after they failed to locate her name on the voter roll. The judge could have sentenced Mason to anywhere between two to 20 years in prison or probation. Mason’s defense attorney has filed an appeal. Dallas, TX (BlackNews.com) — Daudreanna Baker of Hazlehurst, Miss. is the winner of the 2018 Tom Joyner Foundation® “Full Ride Scholarship” that will cover full tuition, room and board (on campus only) and books up to 10 semesters. Baker, who is the oldest of four raised by a single mom at her home about 30 minutes south of Jackson, Miss., plans to attend Howard University in Washington, D.C., where she plans to become a Chemistry/Pre-Med major. Tom Joyner, the Foundations chairman and founder, announced his scholarship today during the Tom Joyner Morning Show, which airs on 100 stations and reaches a broadcast and digital audience with more than 10 million listeners every week. Baker, who is graduating from Hazlehurst High School, was selected from hundreds of applicants from around the country for the scholarship. Click here to listen to her interview on the Tom Joyner Morning Show. Baker is our eighth Tom Joyner Foundation Full Ride Scholar. Previous winners include Z’Kijah Fleming, who is attending Howard University, where she is majoring in business. Morgan Brown, who is attending Spelman College in Atlanta, Ga., pursuing a career in psychiatry; JoAnn Jones who is attending Winston Salem State University in Winston Salem, N.C., pursuing a career in nursing; Titus Ziegler Jr. of Atlantas Inman Middle School who served as a commander of the elite Junior ROTC Color Guard and Cheyenne Boyce of Detroits Cass Technical High School, graduated Phi Beta Kappa from Spelman College in Atlanta was a Fulbright Scholar in Malaysia and now works at the Confucius Institute in Washington, D.C.
Blaine Robertson of Reserve, La. graduated from Howard University in Washington, D.C. with a B.S. in mathematics and a B.A. in history with a minor in secondary education. The first winner, Britney Wilson of Brooklyn, N.Y., recently passed the New York Bar. She graduated from the University of Pennsylvania Law School and she graduated Phi Beta Kappa from Howard University. Ms. Wilson has worked in the New York offices of the American Civil Liberties Union (ACLU) and is now a Bertha Justice Institute Fellow at the Center for Constitutional Rights. To retain the scholarship, students had to meet the required academic standards each semester. Graduating high school seniors applied for the scholarship by going to www.TomJoynerFoundation.org. To be eligible, students had to meet the following criteria: 1) Be a United States citizen; 2) Be a current high school senior attending school in the United States. Each applicant must complete high school in the spring of 2018; 3) Have a minimum high school grade point average of 3.5 (on a 4.0 grade scale, excluding home school studies) and minimum SAT score of 1400 (combined math essay and verbal score) or ACT score of 30; 4) Applicants had to apply and be accepted to an HBCU by July 1, 2018; 5.) Applicants had to demonstrate leadership abilities through participation in community service and extracurricular activities. Photo Caption: Tom Joyner, nationally syndicated radio show host and founder and chairman of the Tom Joyner Foundation standing next to Full Ride scholarship winner Daudreanna Baker of Hazlehurst, Miss., her mom, Lillian Tillman, and the scholarship banquet keynote speaker Dr. Walter Kimbrough, president, Dilliard University. The 24th Annual African-American Film Marketplace and S.E. Manly Short Film Showcase — one of the best short film festivals in the country — opens April 27-29, 2018 celebrating the work of diverse filmmakers. Hollywood, CA (BlackNews.com) — On Friday, April 27, 2018, award-winning actor, William Allen Young of the CBS hit show Code Black, will host the opening gala celebration, “A Great Day in Black Hollywood” at the Nate Holden Performing Arts Center to kick off the 24th Annual African American Film Marketplace (AAFM) and S.E. Manly Short Film Showcase held April 28 – 29, 2018 by The Black Hollywood Education and Resource Center (BHERC). The popular gala honors diverse leading and legendary professionals, as well as the filmmakers selected for the 2018 S.E. Manly Film Showcase (“SEMSFS”), one of the top short film festivals in the industry. In fact, some of the filmmakers who have had their shorts exhibited at the SEMSFS, as they were launching their now extraordinary careers include: Black Panther director, Ryan Coogler; Oscar-nominated writer-director of Mudbound, Dee Rees and writing-directing icon Gina Prince-Bythewood. Though Young is presiding over an awards gala bestowing accolades on luminaries in the business, he, too, has been an illustrious standout in entertainment. A graduate of USCs acclaimed School of Dramatic Arts hes starred in over 100 television, stage and feature projects, including the Oscar-nominated films, District 9 and A Soldiers Story. Among his television projects are Emmy-winning and Emmy-nominated TV series and TV-movies, such as: CSI: Crime Scene Investigation; Good Luck Charlie; Serving in Silence: The Margarethe Cammermeyer Story (starring Glenn Close); and The Women of Brewster Place (starring Oprah Winfrey). Notwithstanding, his current series Code Black – where he stars as “Dr. Rollie Guthrie” – is a Peoples Choice Award drama series nominee. And of course, hes also lauded for his groundbreaking portrayal of “Frank Mitchell”, the tough-but-loving father on the hit TV series, Moesha. In addition, Young is a director and member of the DGA (where hes served as a Co-Chair of the DGAs African American Steering Committee), as well as the Academy of Television Arts & Sciences and the American Film Institute. “We are proud to have William Allen Young join again as our Host for our Opening Celebration,” said BHERC Founder and President, Sandra Evers-Manly. “William is not only a gifted actor he is a treasured Humanitarian who gives so much to the community.” Indeed, the Washington D.C. born/South Central Los Angeles-raised Young – also a Ford Foundation Freedom Unsung Award recipient – has maintained his connection to the community through his non-profit, the Young Center for Academic & Cultural Enrichment. It has created opportunities for thousands of underserved youths to obtain a college degree and become successful business and community leaders. Students from over 250 schools have participated in the organizations award-winning programs and its alumni have been accepted at over 80 U.S. colleges and universities to date. Though the gala takes place at the Nate Holden Performing Arts Center, the SEMSFS takes place at the Raleigh Studios on Saturday, April 27 through Sunday, April 29, 2018. Films are screened on both days from 10 am until 10 pm. The BHERC Youth Diversity Short Film Festival, featuring young aspiring filmmakers of tomorrow from local arts organizations and High, as well as communities across the country takes place Saturday morning, 9 am to Noon beginning with breakfast. This portion of the Festival is Free to the Public. Sunday Morning, Films With A Purpose hosts the LA Premier of 21 and Done. The untold story of youth aging out of the foster care system. This special event features a post-screening Q and A session with the filmmakers followed by Brunch. Closing the Festivities on Sunday night includes the classic Soul Food & Film Reception at 9:00 p.m. The costs include: Opening Night Festivities $55 (at the Nate Holden Performing Arts Center, 4708 W Washington Blvd, LA, CA 90016); a pass for a block of films is only $15 for students with ID and $20 for the general public; All Day Pass is $50; “21 and Done” Premier is $25; Closing Night Reception is $25 (Soul Food & Film); and the Weekend Pass (includes Opening Night, All Day Pass for films, Closing Night Reception, T-Shirt and BHERC Commemorative Bag) is $150. To purchase tickets and for the complete schedule, please visit www.BHERC.org or call (310) 284-3170. To attend the Film Festival consider riding LA Metro – GO METRO: Take the Metro Local Line 10/48 to Melrose Ave. & Van Ness. Raleigh Studios is right across the bus stop on Melrose Avenue. Plan your trip on metro.net or call 323.GO. METRO (323-466-3876). Armed with that information, investigators worked backward from the mortgage company, eventually identifying the hack—and the hackers. By that time, Baden was hiding in Mexico. In 2014, he was named to the San Diego FBI’s Most Wanted Cyber Fugitives list, and the reward offered in the case eventually led to his capture in Mexico, Christopherson said. All four subjects pleaded guilty to their roles in the fraud scheme. In 2015, Baden was sentenced federally to nine years in prison. In January 2018, Fernandez was sentenced to more than 10 years in prison. Bailey received a sentence of more than five years, and in February 2018, Nava was the last subject to be sentenced, to 44 months in prison. But even years after the crimes were committed, Christopherson said, “the court was still receiving victim impact statements.” Many victims were unable to get jobs or be approved for mortgages or car loans because their credit had been ruined by the fraudsters. “We are pleased that these criminals are now behind bars and will not be able to victimize anyone else,” said Christopherson, who encouraged the public to regularly check their credit information to make sure their personal information has not been compromised. Attorney Ernesto D. Borges, Jr. stars on WVON's Cliff Kelley show every Monday from 3:30 p.m. to 4:30 p.m.